(March 21, 2019) There’s no denying the re-emergence of yacht rock, that cool late ‘70’s and early ‘80’s rhythmic rock that often felt like L.A’s blue eyed soul. It’s been ringing and tingling in our ears lately. It’s taken some root in the evolution of modern funk (see Michael McDonald and Kenny Loggins on Thundercat’s “Show You the Way”), penetrated hipster soul (Young Gun Silver Fox, Mayer Hawthorne) and is breaking ground across the country in a swarm of fratboy yacht rock revue tribute bands. Since bursting on our radar back in 2010 with their self-titled debut, Swedish-based band State Cows has carved out a niche in the reawakened genre while immersing in sophisticated Steely Dan jazz and flashy Toto exercises. It’s been the handiwork of their two album releases. As guys of State Cows prepare for the release of their third album, their newest single “Deportee” off the EP Challenges continues in the trajectory that’s best defined their sound. Like leftovers from Gaucho or Donald Fagen’s The Nightfly, the track hums with distant echoes of “Blues Beach” and “New Frontier” done in an alternate universe. Lead vocalist Daniel Andersson even approaches the mic using Fagen finesse. Due to its uncanny design and ambitious reach for youngster MOR rock, “Deportee” doesn’t quite stick like glue to the ear on the first set of plays especially when compared with irresistible funk jazz grooves like “Mister White” that are still imprinted fresh on our brains, but it’s a sneaky slither of sophisto-pop. After hearing a delicious lead guitar solo halfway into the mix from Göran Turborn, its deep splashy synths akin to Captain & Tennille’s “Love Will Keep Us Together” and easy breezy R&B vibes (think Valerie Carter’s “Crazy”), you’ll hear this, walk away for a second and then come back for more. 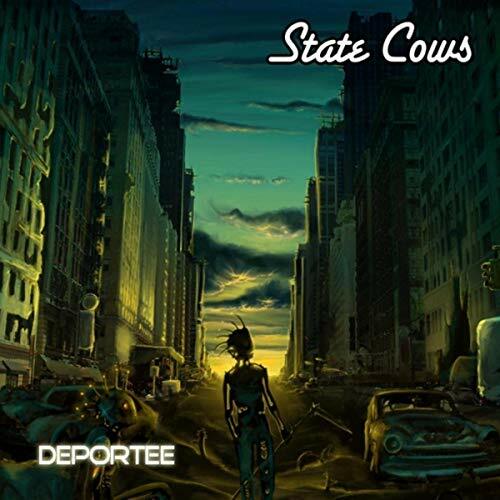 Hear State Cows’ “Deportee” and let us know if you’re “anchored in mind” to it.